ORMOC CITY, Leyte – The Department of National Defense (DND) has teamed up with the Department of Interior and Local Government (DILG) and the Department of Environment and Natural Resources (DENR) to strongly advocate peace and order matters and “zero basura” in relation to disaster risk management, according to Defense Secretary Gilbert “Gibo” Teodoro. Speaking before a gathering of municipal local chief executives at the Sabin Resort Hotel here for the Luzon Island conference of the League of Municipalities of the Philippines (LMP), Teodoro empowered the Mayors to form the crisis management committee at their levels to better respond to any call for emergency. With an organized and functional crisis committee headed by the Municipal Mayor, sudden events can be taken as a coordinated activity, such as kidnapping incidents, insurgency, and even disaster response, Teodoro said. He cited the case in the southern part of the country where the local government unit created a crisis committee after a series of kidnapping happened, adding that such creation can be done in areas even without such incidents happening yet as a pro-active measure. As to the “zero basura” campaign of the DENR, Teodoro acknowledged that the garbage problem had been a cause for calamity in some areas when rivers are clogged, so this was covered also by the DND’s advocacy on disaster risk management. He was referring to the first speaker, DENR Assistant Secretary Gerardo Calderon, who urged the LGU chiefs to comply with the provisions of the Ecological Solid Waste Management Act or RA 9003, or face eventual sanctions for non-compliance. Teodoro is concurrent head of the National Disaster Coordinating Council (NDCC). Towards the end of his talk, Teodoro hinted at intensifying relations with the LGUs in some future time, particularly in the matter of defining a deeper meaning to local autonomy and in the matter of capacity-building for them so they can make positive initiatives on their own for the good of the locality. QUINAPONDAN, Eastern Samar – Eastern Samar Governor Ben P. Evardone hopped 6 barangays and ended his Quinapondan’s barangay visits at the municipal town plaza to personally turn-over various projects and deliver basic services to this town’s 25 barangays as the Project Barangay Empowerment Network (Project BEN) entered its second and final day in this municipality. Gov. Ben P. Evardone headed the distribution of toothbrushes and toothpastes to the Principal of Bagte Elementary School as part of the recently concluded “Project BEN: Barangay Empowerment Network”, a public service program of the Provincial Government. Also in photo are Brgy. Capt. Conrado B. Gudez of Brgy. Bagte and a teacher-representative of Bagte Elementary School. Among the commodities that Governor Evardone distributed to some 6000 residents are Philhealth cards, sports equipment, toothbrush, toothpaste and packs of rice. Also highlighting his visits were the turn-over of the P20,000 provincial aid to every barangay. According to Julio Gonzales, Brgy. Captain of Brgy. Naga, the move of the governor was unprecedented as it’s the first time a governor gave time to personally visit and bring the assistance to barangays. 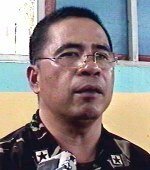 Edilberto ‘Jun’ Grata, chief of political and external affairs of the governor, said that this is a concrete stir of the governor to practically bring the government to the people. “The governor is bent to visit every barangay in the province to bring services himself to his constituency,” Grata said in an interview. Mayor Nedito Campo of Quinapondan expressed utmost recognition to Evardone for choosing his town as the first to be visited this year by the Community Outreach Development Program (CODP) under Project BEN. “This is the best birthday gift the governor has given me,” Campo, who was celebrating his birthday, said. The mayor divulged that prior to the series of activities Evardone already asked him what he wished him to give during his birthday. “This comes as a big surprise to me,” Campo noted. Campo, together with Gov. Evardone and other provincial and municipal officials, visited Brgys. Bagte, Buenavista, Naga, Alang-alang, Sto. Niño and the town’s Poblacion. The visits however were attended by all barangays of the municipality. Prominent officials who were with the group were Sangguniang Panlalawigan members Atty. Jovi Opinion, Atty. Enerio Sabulao, Colon Yu and Betty Reyes. Also present were province’s Budget Officer Necitas Ponferrada, General Services Officer Vilma Bormate, Planning and Development Officer Henry Afable, Assessor Manuel Baldono, Veterinarian Dr. Romeo Debora, Agriculture Service Officer Jesus Agda and Engineer Dindo Picardal. Teachers of Buenavista Elementary School, said that the distribution of toothbrush and toothpaste to preparatory and elementary pupils will provide a big help especially in the dental problems that haunt many of children nowadays. Dr. Marites Tiu, DepEd’s Dentist-in-charge, said that there really is a need to step up the dental campaign as more children are having dental problems and there is a substantial scarcity of dentists in the province. The provincial chief said that the province made it a commitment to provide toothbrush for the children as part of the dental problem prevention program of his administration. “We recognize that problem and that the best way to fight this is to prevent dental harms by giving toothbrush and toothpaste,” Evardone said. He also asked the children, teachers and parents to ensure the brushes are being used properly. Meanwhile, some 3,000 residents as well received Philhealth cards from the governor to maintain the Philhealth universal coverage of Eastern Samar. “While we are not saying that each of you should be in a hurry to use your cards, but it is still better if you are prepared should health emergency arise,” the governor addressed the beneficiaries. The governor is set to bring Project BEN to Salcedo and Arteche in the coming two weeks while the rest of the municipalities will be scheduled before the year ends. ORMOC CITY, Leyte – The Luzon Island Cluster Conference of the League of Municipalities of the Philippines (LMP) has approved during its plenary session on Wednesday here four out of five suggested resolutions addressed to concerned offices for implementation and information. Significantly, the first resolution, introduced by presiding officer Mayor Winifredo Oco of Labo, Camarines Norte has eaten much of the discussion time due to strong objections, while the four others easily breezed through with virtually no debate at all. 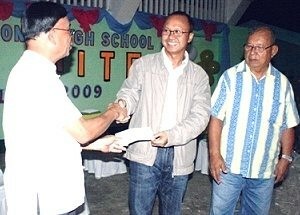 Labo, President of the Luzon Island Cluster and President also of the LMP-Camarines Norte Chapter, lobbied hard to pass a measure so that Congress, through an LMP resolution, modify the guidelines for granting of salary increases to local government employees starting in the month of July simultaneous with national government employees, and not in January 2010 yet as mandated. Mayor Roque Tiu of Tanauan, Leyte, who is President of the LMP-Leyte Chapter, the host, and LMP General Counsel, explained that a provision in the General Appropriations Act (GAA) specified that LGU employees can have their increases only by January 2010. Roque divulged that in the LMP forum held at Cagayan De Oro and Davao recently, the general sentiment was to simultaneously grant the increases this July, especially for LGUs which can do it subject to available funds if not for the limitation set by GAA, hence the need for an LMP resolution. But this move was met with stiff opposition by Mayors Edgardo Zarragosa from Ilocos Sur and Rey Catacutan from Tarlac. The two invariably reasoned out that under the proposed scenario, third to sixth class municipalities would be pressured to comply for an earlier salary hike implementation. They also argued that Congress would not have enough attention to act favorably on the initiative and would just be overtaken by time, eventually, for the GAA's mandatory execution for LGUs in January next year. A division of the assembly was ultimately carried out to settle the issue, in which only twenty Mayors stood to support it, while the majority of over a hundred in attendance rejected the proposal. For the last item, Lian De Leon, LMP Executive Director, informed that LMP's inputs for the welfare of upland communities were made as the basis for President Gloria Macapagal-Arroyo's signing of Executive Order 606 on sustainable upland development. She said a conference for upland municipalities will definitely be slated the soonest time possible as the schedule permits. Ormoc City Mayor Eric Codilla welcomed the participants during the opening ceremonies held at the Sabin Resort Hotel here in the city. TACLOBAN CITY – Up to this date, there is not a single incidence of death due to A(H1N1) in Eastern Visayas yet, DOH Region 8 Director Edgardo Gonzaga informed the Philippine Information Agency. The clarification was made by Dir. Gonzaga after a 60 years old teacher from Bethel International School died of acute myocardial infarction (AMI) commonly called a heart attack, at 9:00 o’clock in the evening of July 21. Director Gonzaga said that the teacher was indeed an A(H1N1) confirmed positive case and that she was treated on July 14 to 17. On the 17th, she was already classified as treated, Director Gonzaga said. The DOH 8 Director said that he learned about the case Tuesday night from his staff. He then directed his staff to get the medical history of the female teacher who is a foreigner. The medical record showed that three months ago, the teacher had a gall bladder operation, after which she had an adhesion (“nagkadikit-dikit yong organs”) so she had to be under the blade again. Aside from that, she had a history of bradicardia: A slow heart rate, usually defined as less than 60 beats per minute, Director Gonzaga added. The teacher also has a history of hypothyroidism and varicosities or varicose veins. On July 21, she consulted a doctor complaining of difficulty in breathing. She was advised to be confined at the hospital where she expired on or about 9:00 o’clock in the evening of the same day. It could be said that there is really a need to seek the advice of a medical doctor when one is sick, Director Gonzaga said. Although A(H1N1) in the Philippines is considerably mild, medical services must be sought in high risk cases. One is considered a high risk case when one is already aging and has a history of other illnesses such as diabetes, hypertension, and heart disease, among others. With proper medical attention, A(H1N1) is self-limiting. One can just have a self-quarantine, Director Gonzaga said as he called on the public to continue the practice of proper hand washing, proper coughing and lung-clearing etiquettes and social distancing. TACLOBAN CITY – Major General Arthur Tabaquero, commanding officer of the 8th Infantry Division of the Philippine Army based in Catbalogan City, Samar, has ordered hot pursuit and intensified security and clearing operations against the insurgents in Samar. The order was made as soon as he learned that about 15 members of the New People’s Army, three of who were wounded, scuttled for safety after a 10 minute encounter with the military troopers of the 8th Infantry Division of the Philippine Army at Hinabangan, Samar, in the morning of July 20, 2009. MGen. Tabaquero also called on the public to continue to help and report to the military in their respective areas, the presence of insurgents because for as long as they are there, no true peace and development could be achieved in Samar and in the entire Eastern Visayas Region. Lt. Colonel Armand Rico, information officer of the 8th ID informed that the elements of the 801st Infantry Brigade under the leadership of Staff Sergeant Joel Sonio were on a security operations at the vicinity of Barangay Cansolabao, Hinabangan, Samar at about 10:28 in the morning of July 20, 2009, when they encountered a fully armed group of communist terrorists composed of about 15 New People’s Army members. The ten minutes gunfight resulted to the withdrawing of the communist rebels who scampered for safety bringing along with them their three wounded comrades, as reported by the civilians who were at the vicinity during the encounter. No casualty was reported on the side of the government troops. The military recovered war materials such as two detonating chords; seven magazine for long M15 with ammunitions; one magazine for short M16 with ammunitions; three jungle packs; and assorted communist terrorist documents with high intelligence value. QUEZON CITY, Philippines – Kaya Natin! Movement for Good Governance and Ethical Leadership launch the new batch of inspiring Filipino leaders working towards positive change in our country on July 16 at Fr. Pacifico Ortiz Hall, Ateneo de Manila University, Loyola Heights, Quezon City. No less than Kaya Natin! co-founder and Pampanga Governor Ed Panlilio welcomed the new champions consisting of national and local lawmakers. “Kaya Natin! is a group of good people joining forces to promote genuine and lasting change in our government,” he stressed. The 4 lawmakers cited by Kaya Natin! Movement as new champions of good governance are former 1st district Bukidnon Congressman Neric Acosta, Deputy Minority Floor Leader and 2nd district Bukidnon Congressman Teofisto “TG” Guingona III, Quezon City Councilor Jorge “Bolet” Banal, and Davao City Councilor Mabel Sunga-Acosta. The current Kaya Natin! champions of good governance are local executives from Luzon and Visayas, namely: Mayor Sonia Lorenzo of San Isidro, Nueva Ecija, Governor Teddy Baguilat, Jr. of Ifugao, Mayor Fermin Mabulo of San Fernando, Camarines Sur, Mayor Florante Gerdan of Sta. Fe, Nueva Viscaya, Mayor Roque Verzosa, Jr. of Tagudin, Ilocos Sur, Mayor Marivic Belena of San Jose City, Nueva Ecija, Vice-Mayor Valente Yap of Bindoy, Negros Oriental, former Mayor Gloria Congco of Cabiao, Nueva Ecija and former Mayor Mary Jane Ortega of San Fernando City, La Union. Kaya Natin! co-founder and Naga City Mayor Jesse Robredo, Mayor Gerdan, and former Mayor Ortega took turn in introducing and handing over the Kaya Natin! t-shirt and baller ID band to the new champions. The newest champions of the Kaya Natin! Movement signed a covenant of good governance in which they promised to fight graft and corruption, promote transparency, social accountability, and people’s participation in governance, eradicate illegal gambling, ensure clean and honest elections, and oppose amendments to the Constitution before the 2010 elections. “Kaya Natin! aims to encourage Filipinos from all walks of life to be proactive citizens in promoting good governance through transparency and social accountability,” said Mayor Lorenzo in her closing statement. “Aside from this, Kaya Natin! aims to become a leadership sanctuary that provides support to effective, ethical and empowering government leaders in our country,” she added. Kaya Natin! is a national movement open to every Filipino who believes and is willing to work toward promoting genuine change and ethical leadership. The founders of Kaya Natin! are Naga City Mayor Robredo, Isabela Governor Grace Padaca, and Pampanga Governor Panlilio. Robredo and Padaca are recipients of the Ramon Magsaysay Award for Government Service while Panlilio was a recent awardee of the Gawad Galing Pook Award for Outstanding Local Government Units. Since it began last year, Kaya Natin! has already visited more than 70 colleges and universities all over the country. Aside from educating the people, Kaya Natin! believes that Filipinos have the ability not just to support good leaders, but to contribute to the progress and development of the country by being good citizens themselves. Kaya Natin! hopes that every Filipino would be inspired and empowered to choose effective and ethical leaders in the coming May 2010 computerized elections. CATBALOGAN, Samar – Samar’s Provincial Environment and Natural Resources Officer (PENRO) George Guillermo sought an audience with Samar’s capital town lawmakers to look closely into the flashflood that swarmed Sto Niño, San Andres and other barangays as typhoon Feria raged last month. Where does the money go? For decades, despite of the huge maintenance fund, the DPWH failed to regularly maintain this Antiao Creek which serves as the main drainage canal in Catbalogan, causing serious flooding during heavy rains. Speaking before the Sangguniang Bayan (SB) members the other week, Guillermo cited that Catbalogan was the most hardly hit by the typhoon with flashflood occurring in Brgys. San Andres, Canlapwas and other five adjacent barangays. He added that water rose to three meters deep. Many houses were under water and personal belongings were either covered with mud or carried away by the flooding waters. Barangay San Andres and Canlapwas are in the floodplain and situated along the Antiao River. Guillermo stressed that the flooding of the barangays along the Antiao River and floodplain areas of Catbalogan was phenomenal as caused mainly by the extremely high typhoon rainfall of 194 mm. (PAG- ASA Record) on June 23, 2009. This, he explained was preceded by 130.60 mm. rainfall on June 22, 2009, a day before the typhoon. The extreme rainfall, he said was compounded by the unregulated/illegal construction of structures (houses/building) along the river that obstruct the river flow. Another headache that causes obstructions is the “non functional” drainage systems of Catbalogan, as these are either heavily silted or “choked” with garbage. Guillermo then offered solutions which the SB noted. For one, he recommended evaluation/assessment of the drainage capacity of Antiao River particularly on illegal structures/improvements that impede/obstruct water flow and strong recommendation for corrections. He also urged the LGU to ensure functionality of all the drainage system (both man-made and natural drainage – creeks, gullies, etc). This, he added, can be done by mapping all these drainage system especially the natural ones and asses the status of these areas whether they are still functional or not as they might have been used for other purposes due to proliferation or seemingly uncontrolled construction of buildings and/or houses in the Catbalogan. Further, PENRO said that a massive reforestation and/or agro-forestation of denuded/open land areas of Antiao Watershed be done. Still he added that cutting back of all tall trees to the general canopy level of other vegetation is urged to reduce the risk of being blown down or uprooted due to “exposed” crown. Densely crown trees particularly gmelina are generally observed of having no tap or primary roots because they were intentionally cut in the nursery as “standard’’ practice. Similarly, the forester also urged to strengthen the Urban Forestry Program to manage and maintain trees/vegetation along roads/highways and other public areas with the main purpose of protecting and safeguarding public welfare in harmony with environmental or greening requirements. Antiao watershed drained to poblacion via Brgy. San Andrers, Sto. Niño and Brgy. Canlapwas. The watershed of Catbalogan comprises about 3,500 hectares or 35,000,000 million square meter which catches rain of 212 mm or 1/5 of meter and drains all these to Antiao river that passes the barangays of Sto.Niño, San Andres and Canlapwas. A watershed is any sloping land that shed water by way of specific stream or river system towards a common outlet or point which maybe a dam, irrigation system or municipal water supply. A watershed has a perimeter, area, and a common outlet like a kitchen sink. Antiao watershed is 75-80% denuded and most areas are grassland, open land with indicators of severe erosion and a landslide prone area. 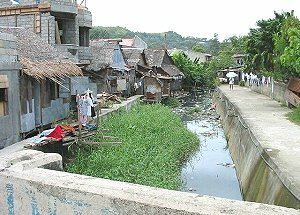 Man’s activity of throwing of garbage’s on Creeks River of household along the area also causes clogging of canals that slow down the flow of water. PASAY CITY, Philippines – The government’s short-sighted approach to education remains the main stumbling block to the country’s long-term economic prospects, opposition Sen. Chiz Escudero said. School tables and chairs, are some of the immediate classroom needs by our public school teachers in far-flung barangays which our DepEd failed to provide. 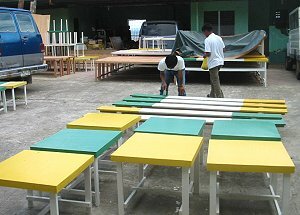 Here, workers of Samar vice-governor Jesus Redaja are busy assembling classroom chairs and tables requested by many teachers. With meager funds, the vice governor preferred to build the items to make the most of it. “The world has been moving from an economy of goods to an economy of knowledge. Unfortunately, education, which is the main tool in converting to an economy of knowledge, continues to get scant attention from the government,” Escudero said. “Our educational system is in dire need of an overhaul. The government’s attitude towards education has left wide, gaping loopholes that need to be immediately addressed,” he added. The 39-year old senator called for a “no-child-left-behind” policy for education, given the country’s embarrassing dropout rates for elementary (6.7 percent) and high school (8.9 percent) in the past five years. “We must give our children the equal opportunity to develop their minds and bodies to the fullest. We will continue, even expand, the conditional cash transfers (or CCT’s) to the poorest families so that their children will have the means to get to school,” he said. Escudero said education should be a genuine tool of national policy especially in relation to economic development. “The higher the knowledge and skills of our workforce, the higher their earning power will be. This redounds to improved economic activity. Whether our workforce decides to remain here or go abroad, the economy will still benefit because of their remittances,” he explained. “We must bring together and match our graduates with the demands of industry and the market,” the senator added. Escudero also called for the implementation of an ICT (information and communication technology) Education Development Plan as a major step towards establishing a knowledge-based economy. “Our neighboring countries have recognized the importance of ICT in education. They have adopted and are implementing national policies and strategies towards this end. We must step up efforts to institutionalize ICT as a national priority in education,” the senator said. Escudero lamented that fundamental issues such as classroom shortages continue to hound the country at a time when other countries have moved to the next levels of education development. “While we talk of knowledge-based economies and ICT as institutional educational platforms in other countries, the Philippines still has a backlog of 40,000 classrooms,” he said. “At a cost of P500,000 per classroom, it would cost only P20 billion to build everything. That’s only one year’s income of PAGCOR. I am incredulous how the future of millions of Filipino children has been irretrievably lost because of the insatiable greed of those in power,” Escudero said. CATBALOGAN, Samar – Actress Tessie Tomas, also a popular comedienne met the Samar Girl Scout of the Philippines (GSP) Council on last Wednesday at the GSP Headquarters in downtown Catbalogan. Ms. Yna Sanchez, GSP Executive Officer said that Ms Tessie who also hails from Catbalogan is the President of the Katbalaoganon Foundation and that she was in town to donate foodies for the flood victims in Sitio, Sto Niño, Barangay San Andres. More than 700 families from the same barangay experienced flooding of up to 3 meter-deep when typhoon Feria struck last month. The actress told other GSP council officers that her brother whose house is in Sto Niño also is a ‘flood victim’. The lady also sidetripped to GSP to check how, she, and the foundation by Catbaloganons in Metro Manila can help. Thereupon, she donated some t-shirts for the differently abled GSP members whose day will be celebrated come July 21, 2009. The lady though said she does not want people to know what she is doing because they suspect her of running for an elective position. But she is actively involved in socio-civic activities being the President of the foundation founded by fellow Catbaloganons. Ms. Nene Valles of GSP Council thanked the lady who still ‘looks back’ to hometown Catbalogan. Ms Tomas, daughter of radio talent Laura Hermosa, stars with Judy Ann Santos and Ryan Agoncillo in the sitcom George and Cecil shown at ABS-CBN on Sunday evenings. TACLOBAN CITY – Some P58.1 Million was released to the local government units in Eastern Visayas, in fulfillment of President Gloria Macapagal-Arroyo’s promise to grant financial assistance to LGUs as embodied in the Office of the President directive dated November 5, 2008. The directive provided for financial assistance equivalent to two months out of the IRA deficiency in 2008. Director Imelda Laceras of the Department of Budget and Management in Region 8 informed that of the total initial release, the municipalities got the biggest share with 77%, the six provinces got 18%, the cities got 5% while the barangays got 0.6%. The good director explained that of the initial release of P58.1Million, about P44,521,649 was released to the qualified municipal local government units. Some P10,171,005 was released to the Region 8 provinces while the sum of P3,055,513 was release to the cities and P350,095 was released to the barangays. The release, Dir. Laceras said, was charged against the 2008 Kilos Asenso Support Fund of P2 Billion. The Kilos Asenso Support (KAS) Fund of President Gloria Macapagal-Arroyo aims to sustain the programs and projects of the Local Government Units which are adversely affected by the decrease in their Internal Revenue Allotment Shares in 2008. The Department of Budget and Management through Budget Circular No. 2009-1 dated March 10, 2009 released the guidelines for the release of the Kilos Asenso Support Fund to sustain the programs and projects of the Local Government Units. Pursuant to Republic Act No. 9498 or the Fiscal Year 2008 General Appropriations Act, the KAS Fund shall be used as the counterpart fund of the national government to support the programs and projects of the LGUs under the Kilos Asenso Program. The Kilos Asenso Support Fund will be utilized to sustain development and to provide for the deficiencies for the construction of farm-to-market roads, small bridges and day care centers; improvement of potable water supply; and other similar growth enhancing projects designed to uplift the socio-economic standing of LGUs. Growth enhancing projects refer to those which will promote employment, education, health, and housing in the LGUs. Director Laceras called on the LGUs that have not yet submitted their letter request and the use of fund supported by details of the project, to the Department of Budget and Management, to do so as soon as possible as these are necessary in the release of said fund. TACLOBAN CITY – Police Chief Superintendent Mario R. Sandiego, regional director of Police Regional Office 8, immediately created Task Force Matuguinao that will investigate and determine the real motive in the killing of the mayor of Matuguinao, Samar in the evening of July 16. Director Sandiego said that the Task Force will take charge of the comprehensive investigation over the killing of Hon. 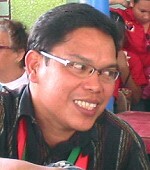 Carlos dela Cruz, the municipal mayor of Matuguinao, Samar. Director Sandiego designated his Deputy Regional Director for Operations, Senior Superintendent Gil Jamila Hitosis, to head the said task force. The Task Force Matuguinao will be augmented by seasoned investigators from the Regional Police Office, he added. Reports received from the PNP 8 Police Community Relations Officer Manuel Cubillo disclosed that on or about 7:20 in the evening of 16 July 2009 at Azucena St., Brgy San Pablo, Catbalogan City, Hon Carlos Dela Cruz, 53 yrs old, married, a resident of said place and Municipal Mayor of Matuguinao, Samar, was shot inside his residence by an unidentified person hitting the victim on his right chest portion of his body. The victim was immediately brought to Samar Provincial Hospital by his immediate relatives but later died while undergoing medical treatment. His cousin suffered a gunshot wound on his left waist, allegedly inflicted by a caliber .45 pistol. Initial investigation conducted by the Catbalogan Police Station revealed that the victim was having conversations with his cousin, a certain Joel Adel, also of legal age and a municipal auditor, when the gunman with two unidentified companions who served as back-up shot the victim and his cousin and right after, threw a hand grenade inside the house. The police investigators recovered at the crime scene, evidences such as one grenade safety pin; seven empty shells of caliber .45; four slugs of caliber .45; two suspected hand grenade flagments and splinters; and one safety lever of a hand grenade. The operatives of the Catbalogan City Police Station led by Police Chief Inspector Ramil Ramirez are currently conducting monitoring and discreet operations in order to identify the assailants. Matuguinao is a 5th class municipality in the province of Samar which according to the 2007 census has a population of 6,589 people. Mayor dela Cruz, 53 years old, is a first termer mayor and was to seek reelection in the 2010 election where he would have been pitted against incumbent Matuguinao Vice Mayor Aran Boller. BORONGAN, Eastern Samar – Recognizing the vital role played by the parents in the education of the Eastern Samareño youth, Governor Ben P. Evardone graced the Dolores National High School (DNHS) and Taft National High School (TNHS) Homeroom and Federated Parent Teachers Association (FPTA), July 10, and 13 respectively, giving various projects and donations to the said schools. For the DNHS Science Department, the Governor donated one set of computer complete with accessories, while for the Math Department, P10,000 was given for the garden project of the said department. And as a commitment to his further support for the FPTCA, he pledged to give P50,000 for a waiting shed project of the FPTCA. “This is a symbol of my continuing support for the education sector of our province, “Governor Evardone told the thankful Doloresnon parents during the turn – over ceremony. “Once a student drops out of school, he might lose a good future. So, it is important for us parents to support our children, because the government can only do so much. Although public education is free, we need to help each other, the government in one hand, the parents in another hand, and the DEPED at the center. It is the only way that we can ensure that we can convince the students to stay in school, and ensure a good future for our children,” the provincial executive further said. The Governor also extended his warm congratulations to the DNHS faculty and administration for achieving an increase in this year’s enrollment, in face of the continuing decline of enrollees and increasing drop-out rate in the province. In TNHS, the Governor handed over P485,000 for the construction of one-room school building, to which Mr. Paquito Tegio, TNHS Principal and Mr. Aniceto Cebreros Jr., FPTA President is very thankful to the Governor. “This project will be very helpful to many of our students especially that our school lacks classroom and some classrooms were damaged by Typhoon Feria. We are very thankful for this donation from the Governor “, Mr. Tegio said in an interview. “Éducation is one of our weapons against poverty. If one student fails to go to school because of many reasons, especially because of poverty, he could fail to succeed in life. That’s why, I am here to appeal to all of you parents, to persevere, to continue supporting your students,” the Governor told the parents of TNHS, in closing. CATBALOGAN, Samar – The Philippine National Police (PNP) Catbalogan is now pursuing all angles as to the motives of the killers of Matuguinao Mayor Carlos dela Cruz. Dela Cruz, along with a cousin named Joel Adel was gunned down Thursday night in his house in Catbalogan. The mayor died while receiving medical treatment at the Samar Provincial Hospital, while Adel was rushed to Eastern Visayas Medical Center (EVRMC) and has been reported to be safe. In a phone interview with Catbalogan Police chief PSupt. Ramil Ramirez, he said that all angles are being considered and pursued. As a mayor, one of the angles being pursued is political although the PNP chief said that it is not necessarily a politically motivated incident, he added that the PNP also considers other factors. Meanwhile, Ramirez requests other mayors from the different towns of Samar to coordinate with his office while they are in Catbalogan for security purposes. It is a known fact that some mayors in far flung municipalities have homes in the capital town, so that the chief would like to secure them once they are in his AOR, Catbalogan. The shooting incident, said Ramirez is keeping his men on their toes in investigation as this is called a high-profile case. But the chief assured the people of Catbalogan that theirs is still a peaceful town and that his men are ‘on alert’. TACLOBAN CITY – Tacloban City Health Officer, Dr. Jaime Opinion Jr., called on all Taclobanons to help mitigate the impact of the novel A(H1N1) virus by being vigilant in protecting their health, by heeding the advisories of the Department of Health on proper washing of the hands and coughing and sneezing etiquettes, by avoiding crowded places and by reporting to their nearest health station, any case or clustering of people manifesting flu-like symptoms. In a phone patch interview with the Philippine Information Agency, Dr. Opinion informed that as of 5:00 o’clock in the afternoon of July 15, the number of schools already suspended is seven, and the number of A(H1N1) cases which tested positive in Tacloban is 46. “This number should be multiplied by 4 or 10 or even more,” Dr. Opinion said, “because remember that the Department of Health is conducting random testing only,” which means that not all those showing symptoms are tested. The City Health Officer explained that considering the many students who have flu-like symptoms, it would be very expensive if all of them are tested. He said that only those who are tested positive are given medicines from DOH. The medicines are given door to door because “we have to give instructions to the parents,” Dr. Opinion said. Dr. Opinion said that in the case of the Sto. Niño SPED Center, about 600 to 800 of the total 1000 plus student population were reported to have been absent because of flu-like illness but only five from the different levels were tested. What is important is that the index case must be identified and tested, the good doctor added. All the five tested cases turned out to be positive, Director Opinion stressed. “So we estimate that the actual number of cases is one half of the total number of students who were showing flu-like symptoms, then we can say that the actual number of A(H1N1) positive cases in that particular school is about 400,” Dr. Opinion said. The Cirilo Roy Montejo National High School has also suspended classes after 3 students were tested positive of the novel virus. At Leyte National High School, the biggest secondary school in Tacloban with a population of 6,700 about 500 students reported that they have symptoms, Dr. Opinion said. Of the 500 students who admitted to having flu-like symptoms, only 8 were randomly tested and all these were positive. The actual positive cases is estimated to one half of the number of students who admitted having the symptoms. As of Wednesday afternoon, classes at Leyte National High School have been suspended, Dr. Opinion said. At the Leyte Normal University, two were tested and the result turned out to be one positive and one negative. Already, the school administrators have suspended since July 13, classes in the elementary, secondary and tertiary levels. Five students at St. Scholastica’s College have also been tested positive so the City Health Office has scheduled a dialogue with the school administrators tomorrow. The Angelicum School has also suspended classes because there have been many absentees from the students and teachers groups. Three have been tested but the results are still being awaited. The Eastern Visayas State University has also suspended the secondary classes because there are symptoms of clustering. Two elementary pupils and two secondary pupils have been tested and the results have not yet been released, Dr. Opinion added. The City Government of Tacloban under the leadership of Mayor Alfred Romualdez has already allotted P3 Million for medications and supplement. These are given to the pupils and students who are ill and are on self quarantine. He said that these students who showed flu-like symptoms will get well sooner or later, in fact even without medication if they have strong resistance. Meanwhile, Dr. Opinion disclosed that Sofia, the daughter of Mayor Alfred and Councilor Cristina Romualdez, who was afflicted by the novel virus together with several of her classmates at Bethel International School in Leyte, is already well and is recuperating. He added that because Mayor Alfred cannot refrain from facing all sectors of people, he was already given chemoprophylaxis.